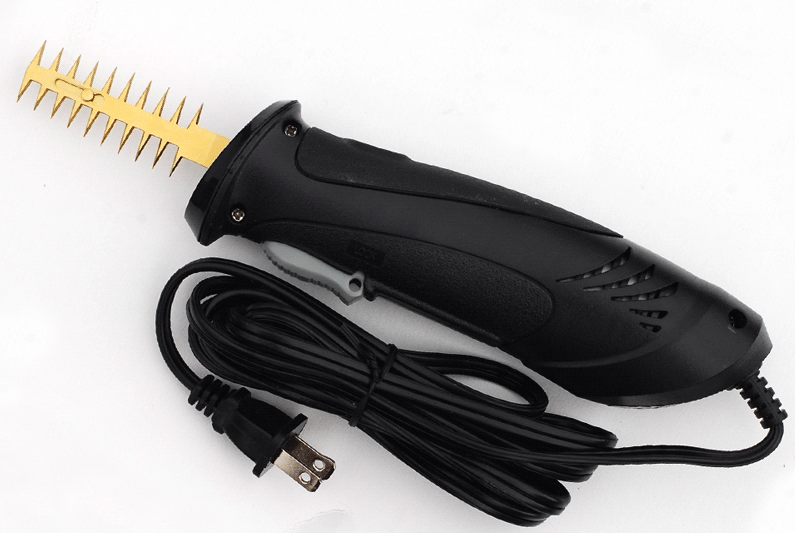 Speedee Corded Trimmer with Hammerhead Blade - FREE Shipping! Dual sided with the widest spacing between the teeth out of all the other blades. This blade is best utilized for de-leafing and pruning overgrown plants during mid-cycle. Best paired with the cordless motor for easy maneuverability around the grow site. Trim flowers with the stem pointed either toward or away from you so that the flat part of the leaves catch in between the teeth. Move the blade in a sweeping motion across the plant going around the stem. The amount of material removed is determined by how close the blade is held to the flower and the angle of the blade in relation to the stem. The closer the blade is angled toward the stem, the more material you will remove and vice versa. Spot trimming can be done by angling the teeth at the blade tip so that it's only the tip contacting the plant. Small precision cuts can be made by this action without touching the surrounding flower. Clean blades by filling cleaner box 3/4 capacity with isopropyl alcohol. Dip blades in box with repeating up and down motion. NEVER SCRAPE THE BLADES WITH ANYTHING METALIC AS THIS CAN DAMAGE THEM! Be careful not to drop or bend the blades as this can throw the alignment off.